Scientists from INRA and Lorraine University in France unraveled a key mechanism in the symbiosis between fungi and trees. During this mutually beneficial interaction, the fungus takes control of its host plant by injecting a small protein that neutralizes its immune defenses thereby allowing the fungus to colonize the plant. This finding is a major advance in our understanding of the evolution and functioning of symbiotic interactions between fungi and plants - relationships that play a significant role in supporting the health and sustainability of our natural ecosystems. These results are published in the advance online edition of the PNAS on 19 May 2014. In the complex world of the rhizosphere - the soil surrounding plant roots - thousands of species of bacteria and fungi compete for resources released by plants. Some fungi, such as truffles and boletus, are able to live in symbiosis with plants through their roots, by-passing their competitors to obtain sugars directly from their host. In return, symbiotic fungi allow plant roots to absorb mineral nutrients; this improves the plant's health, vigor and productivity. Mycorrhizal fungi are one class of symbiotic fungi that make their way to plant roots where they negotiate for housing and all-you-can-eat sugar services. But how does this negotiation play out? Is the host plant able to distinguish between beneficial and parasitic fungi? How does the fungus avoid the plant's immune defenses during the interaction? Thanks to a global collaboration between INRA, Lorraine University, Oak Ridge National Laboratory and the University of Western Sydney, part of the molecular language used by mycorrhizal fungi was partially deciphered. Plant roots are constantly releasing a diverse set of 'signal' molecules into their surrounding soil environment. 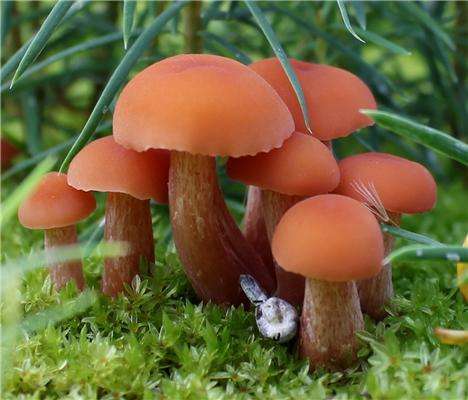 Scientists studied a specific fungus, Laccaria bicolor, which perceives these molecules in the soil and enables fungal growth toward the plant root. The presence of a plant root also triggers the release of small proteins by the fungus. Generically called 'effectors', these small fungal proteins are bioactive molecular signals that prepare plant tissues for a symbiotic relationship. How these molecular signals prepare the plant host for symbiosis with a mycorrhizal fungus has remained clouded in mystery – until now. The research consortium identified one of these effectors, MiSSP7, that binds a molecular switch which controls plant immunity. Normally, when a plant is attacked by a disease-causing microbe, jasmonic acid is one of the main hormones that immediately triggers a battery of defense reactions to kill off the invading organism. MiSSP7 neutralizes this defensive response by directly targeting the jasmonic acid-associated control switch of plant immunity. By hindering the plants ability to generate an immune response, MiSSP7 allow the fungus to develop within plant tissue where it can establish a fair trade for nutrients. These findings show that beneficial microbes, rather than playing nice, are forcing themselves into the plant enacting a symbiotic relationship with the plant nefariously. Research is underway to identify if the other effectors of mycorrhizal fungi act similarly to control the host plant and force symbiosis.